All Dog Owners must present proof of current vaccinations (Including Dog Flu) and Proof of spay/neuter before entering the park. 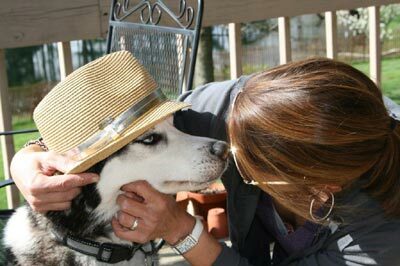 Come see what your dog has been missing! Recently Featured on ABC news and GMA! See What You're Missing at the Companion Club Dog Park! What is the Companion Club Dog Park? Click here to see more dog park FUN photos! Companion Club Dog Park located in Delaware, Ohio (near Columbus) is a private Off-Leash Dog Park in a unique country setting on 11 acres of beautifully maintained grounds with mature pine trees and a 2 acre "Golden Pond". Our Purpose is to create a natural, safe, and happy healthy controlled environment for all our guests. 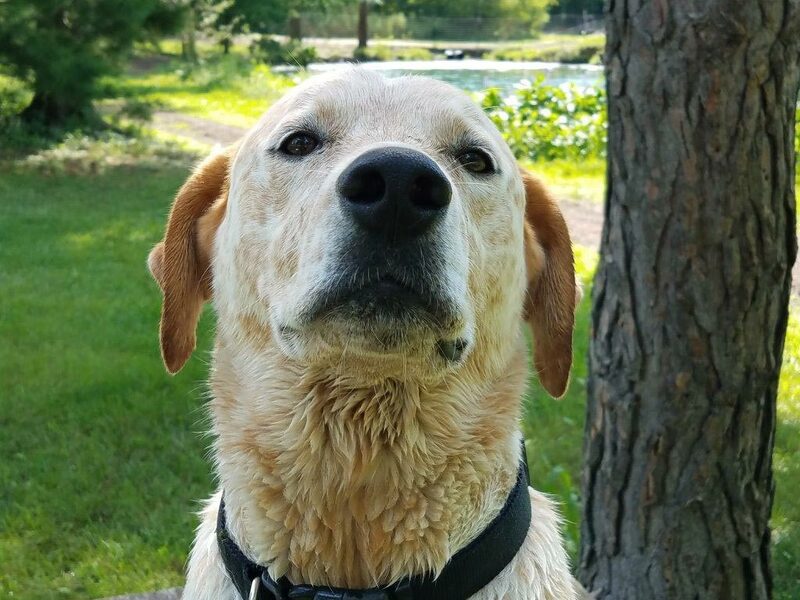 Your dog has the option of swimming, playing ball or simply running free enjoying the great outdoors all in a fully fenced secured area. So come and see what your dog has been missing! 11 acres of running and playing space for your dog. Wooded Trails for you and your dog! Self Serve Dog Wash Area - Free- Make sure to bring towels with you. Park is fully fenced and secure for the safety of you and your dog(s). Updates on all events at CCDP. Plenty of shade trees to get out of the hot sun during the summer. Knowing that we will donate portions of your membership fees to various rescue groups each weekend they attend the park. 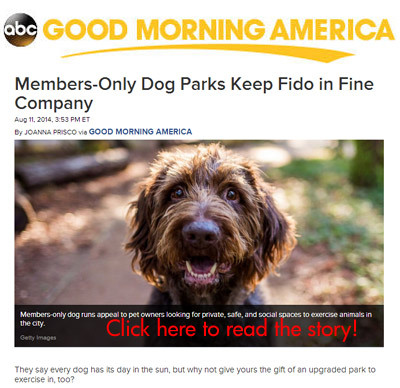 Why use Companion Club's Premier Off-Leash Dog Park? By definition, a dog park is a contained public or private (members-only) area where dog owners may allow their dogs to run off-leash. But there are many dog owners who will argue that a dog park is much more than that, and they would be correct. Prevents off-leash dogs from disturbing other park users and park neighbors, such as joggers, cyclists, small children, and those who may be fearful of dogs. Provides a way for the elderly, sick, and disabled dog owners to exercise their pets. For many dog owners, a dog park may provide the only opportunity for owners to socialize with other people and their dogs. Provides a way for dog owners living in apartments or homes with small yards to legally play ball or Frisbee with their dogs or just let them roll in the grass! Makes a dog a better pet and neighbor because an exercised and well socialized dog is less likely to bark excessively, destroy property, or become aggressive. Creates a greater sense of community by bringing people of all ages and from all walks of life together with a common interest. For many people, visiting a dog park is a primary source of recreation. The ability to share activities with canine family members at a dog park is important, and increasingly recognized by cities. A report on off-leash dog parks by Portland (Oregon) Parks and Recreation states that "There is a newly identified parks user group: Dogs and their owners. This user group is drawn to parks for open space, fresh air, exercise and socialization for themselves and their pets. Coming to a park is their chosen form of recreation, much the same as jogging or biking. They are legitimate park users." Simply stated, dog parks are a place where people and their dogs can play together. We offer dogs off-leash play areas while their people enjoy the park-like setting. The terms ‘off-leash’ and ‘park’ are the key elements that dog owners desire. Limited-control or off-leash dog parks are becoming more popular throughout the United States. As leash laws become more prevalent and more strictly enforced and as human population demands reduce the amount of available free-ranging lands, owners are turning to places like "Companion Club Dog Park" as alternatives, to exercise and socialize their canine companions. Dogs are free to run, play, socialize, explore, and "just be dogs." There are over 1100 dog parks in the United States and Canada combined (Dogpark.com, 2002). Dog Flu: ALL Members & Guests Must Show Proof from your veterinarian that your Dog or Dogs have receive the New Influenza shot. No Exceptions. Paint & refresh the cottage! Visit our past events page to view photo galleries. Companion Club Dog Park... Keeping People and Pets Connected.